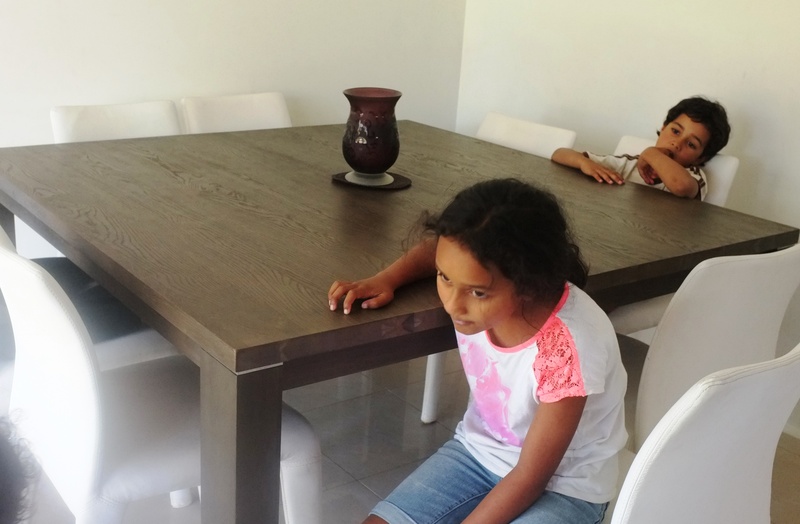 I know it’s just a dining table and chairs but it’s the first one we’ve bought for ourselves and before this we couldn’t all sit down together to eat at the same time. And the old chairs had a narrow centre of balance so every now and then someone would fall off them, especially visitors accustomed to better chairs, which would frighten small children and startle adults who suddenly found themselves partly under the table while still completely sober. I’m so grateful to have been given that old setting just after we were married, when we had no money to buy one. I’m glad to finally see the wonky chairs go but the table will live its third life as a craft/homework/jigsaw puzzle table in another room. I’m enjoying walking past the new setting, putting a vase in the centre of it, sitting down to eat at it. Cleaning it? Not so much. My husband and I have five children aged almost 2 to 10. White chairs! What was I thinking? I’ll tell you what. This thing is a near-new, second-hand, bargain that I was able to snap up from an older couple living near us who had just sold their house. The setting is too big for their new place but perfect for ours, and at less than a quarter of the retail price I can put up with having to wipe down the chairs a bit more often, or nag the kids to do it. I’ve been reflecting a little lately that the furniture we use at home is quite important. It can facilitate and enhance the relationships between people in the family and the people we invite into our homes. It can help shape our lives. There’s a cheap student desk chair that has always been in a little nook in my mother’s kitchen. How many hours we must have spent with one of us sitting there chatting while the other washed dishes, or made lunches for the next day. Without even realising, having the chair there as a simple convenience beside the telephone (from the days before wireless phones) eventually made a difference to the way we communicated through the busy weeks of school, uni, and work life. It kept us communicating. Without the empty chair there as an invitation I might less often have stopped to chat to my mother, but walked straight on to my room. I might less often have offered to dry up while she washed the dishes. What do you reckon? Am I over-thinking it? Are these just chairs and tables and sofas and beds, or do they add something special to our lives? Can furniture, and its placement, be a blessing to a person or a family? Taking it even further, to our relationship with God, can it be a sacramental? So anyway this purchase is the second thing I’ve managed to accomplish from my 40 things before I turn 40 list. The first thing was to start wearing a scapular* every day again (my toddler just discovered it yesterday and his constant tugging on it was a bit annoying, so today I’ve worn it tucked into my clothing. I hope that still counts). We’re already moving out of my birthday month so I have to get cracking on the rest. * For my non-Catholic readers a scapular is two small pieces of cloth connected by a long cord that you wear around your neck underneath your clothing. It’s an abbreviated form of part of a monk’s clothing, signifying commitment to a particular way of life and love for Jesus Christ and his mother, Mary. I figure it’s less painful than a tattoo and with at least as much meaning! More info is here. Previous Post Return of the scapular! I can relate to that lovely feeling of walking past a new dining setting. We bought a white table and chairs from IKEA last year and I love, love, love it. Our biggest problem is trying to keep it clear, as everyone, including myself, finds it a convenient place to dump just about anything. And, yes, with two boys there is a lot of wiping down to do. Wearing the scapular tucked into your clothing definitely counts. The only requirement is that it goes over your shoulders. We have a lot of Ikea in this house Louise! The dumping area here is the kitchen bench. And the scapular, hmm…I was being a bit circumspect in my post because I didn’t want to say I had it all folded up and tucked into my bra (!! )so I’m going to have to rethink this. Put it on properly but pin it to my shoulder straps I guess, so my little boy can’t easily pull it out and pull on it. LOL. Blush. Sorry for being so obtuse. You could get a scapular medal to wear while you have little ones. Then go back to the cloth scapular later. Ah-haa…that makes sense. Thanks Louise!